JG Thirlwell has created the original musical score for Tony Oursler’s feature-length film/installation Imponderable, which will be screened as an exhibition at the Museum of Modern Art in New York from June 18 2016 until January 8 2017. The original soundtrack album to Imponderable by JG Thirlwell will be released on Ectopic Ents in July 2016. It will be available from the Foetus Shoppe and at the Museum of Modern Art. It will be available on CD and digitally, and the CD will be packaged in deluxe digipack with silver foil lettering with a 48 page color booklet containing stills from the film and images from Oursler’s archive of supernatural and occult phenomena. 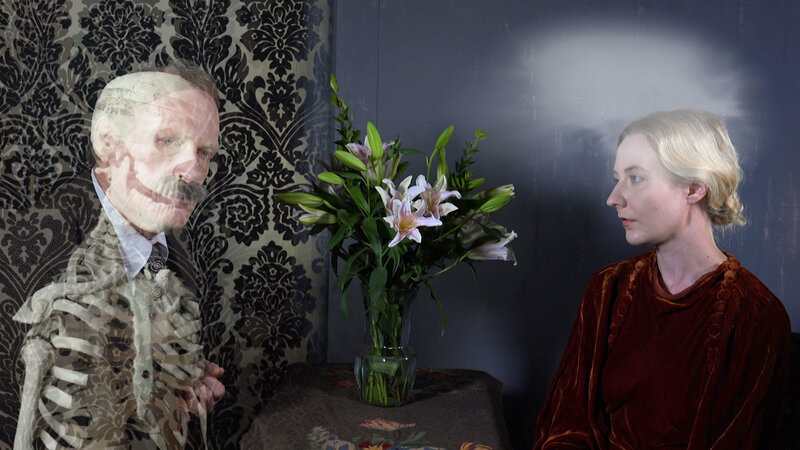 Tony Oursler’s Imponderable (2015–16) offers an alternative depiction of modernism that reveals the intersection of technological advancements and occult phenomena over the last two centuries. Presented in a “5-D” cinematic environment utilizing a contemporary form of Pepper’s ghost—a 19th-century phantasmagoric device—and a range of sensory effects, Imponderable is an immersive feature-length film inspired by Oursler’s own archive of ephemera relating to stage magic, spirit photography, pseudoscience, telekinesis, and other manifestations of the paranormal. Tony Oursler is a multimedia and installation artist whose art covers a range of mediums working with video, sculpture, installation, performance and painting. He and Thirlwell have collaborated n several other projects in the past, including Sound Digressions in Seven Colors (2006).